Elvis Enthusiasts Unite: So, did you do anything fun this weekend? So, did you do anything fun this weekend? Saw Leon Redbone perform in Clearwater in an old, historic theater. Ate Thai curry from a fish-shaped bowl. Wanted to steal bowl. Refrained. Woke the next morning early enough to feel cold sand under my bare feet on the nearby beach. Listened to waves lap up and heard birds talking to one another. Proceeded to shut off my mind a while. Collected mangoes, honey tangerines, tomatoes, strawberries and such from a favorite roadside ramshackle market of sorts. Regretted not adding that big bag of oranges. Wandered around Dinosaur World, once and for all. Didn't get eaten. Saw that same Leon Redbone (again) in an old, historic theater (again), this time much, much closer to home. 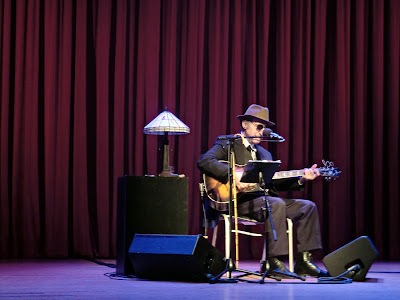 He is Django Reinhart on guitar coupled with a ragtime piano player and singing forgotten songs in the key of Bob Dylan. It works. Made whole-wheat strawberry pancakes. Win. Headed to Tampa with Rowdy Gaines and others where we got to see, meet and hang out with Joan Jett for a spell (!) and watch her perform while we were on the stage. Would I recommend such a thing? I’m going to have to go with a yes. So, back to that original question: did I do anything fun? I tend to think so.